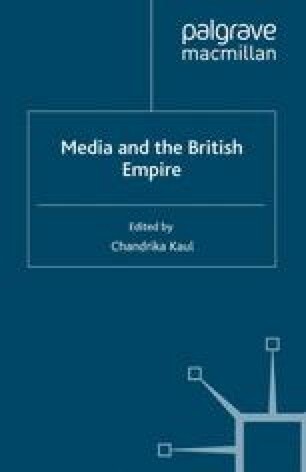 The quinquennial Imperial Press Conferences, which began in London in June 1909, together with their progeny, the Empire Press Union (EPU), were indicative of a growing recognition by the press of its strategic position within the Empire. The Conference was the brainchild of the journalist Harry Brittain, later Conservative MP for Acton, and reflected an appreciation of the growing role of the press, not only within Britain, but in all parts of her far-flung Empire, and a conviction that it was desirable to bring into personal contact ‘those who are charged with the conduct of the great organs of public opinion’.1 A conference bringing together in the ‘Mother Country’ the press of the British Empire could only encourage ‘inter-Empire knowledge and understanding’.2 The idea was accorded a positive reception by the British press, with both Fleet Street and the major provincial papers sinking their differences and remembering ‘only their community of interest’3 — the welcoming reception being attended by around 600 media men representing all shades of political opinion. This was also reflected in the composition of the organising committee, which included, on the Liberal wing, the editors C. P. Scott of the Manchester Guardian, Alfred Spender of the Westminster Gazette and Robert Donald of the Daily Chronicle, while the Conservative press was represented by Lords Northcliffe, Burnham and Arthur Pearson, proprietors of the Daily Mail, Daily Telegraph and Daily Express respectively, and Arthur H. Gwynne, editor of the Morning Post.